After a week of really trying to track and stick to my points and feeling like I failed miserably I was a bit nervous about stepping on the scales this morning. I of course wore my “weighing in” outfit of leggings and a tee shirt. Does anyone else do this? I’ve weighed my clothes so I basically always wear the same thing now. People probably think I don’t own any other clothes!! Anyway I digress- I’d lost 1.5 lbs so I’m almost back to where I was 3 weeks ago. Yippee!! Just 10 lbs more to go and I’m at goal. Ten measly pounds that I just can’t manage to shift! I’m going to have to do it because I GOT THE JOB!! Woooohooo! You are now reading the blog of an official Trainee Weight Watchers leader! The pressure! Ha! Joking of course but I do need to get to my goal weight sharpish! I can’t be going to my big weekend training and not be at goal. So my new goal is to lose 10 lbs by the first weekend in November. Fingers crossed!! I’m so glad he’s being supportive! 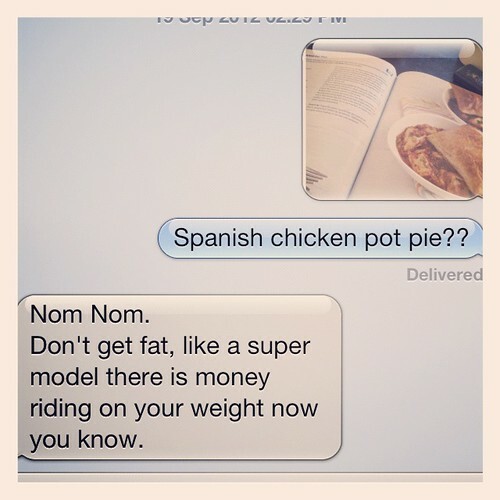 Also being compared to a super model- hahahaha funny. really funny, smartass! I did make it for supper that night and it was delish. It was a few more points than I expected because I misread the puff pasty instructions. I was supposed to take the sheet, cut it in half then cut that half into quarters. Instead I cut the entire sheet into quarters. Oooops! 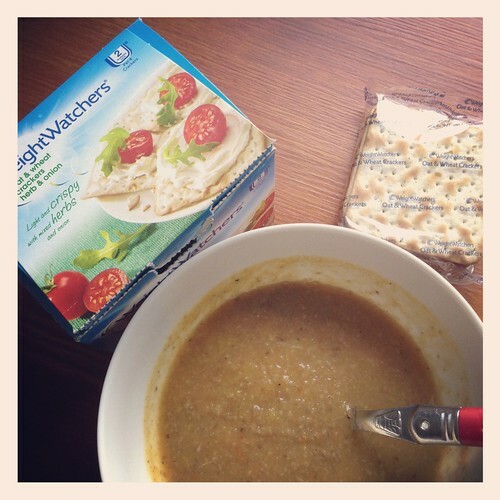 I also tried the new weight watchers crackers- herb and onion flavoured oat and wheat crackers. I made a big huge pot of 0 propoint veggie soup and crumbled the crackers on top. They are very light and crispy but I found them to be yummy. You do have to eat them quickly or they get soggy fast in the soup. I would sprinkle them a bit at a time to avoid this. It was 2 pro points for 4 crackers but I only ate two of them. I’m looking forward to trying them w/ the herb and onion cream cheese weight watchers makes. Might just be the perfect late night snack! Weight Watchers sent me the crackers to try. I am under no obligation to blog about them and all opinions are my own. Next Post I’ve created a monster! woo hoo! figured it OUT!! I can respond now… SSO proud of you! I fell off the diet/ exercise horse so I am desperately trying to get re motivated.. 40+ lbs.. beyond awesome!! Do you feel nervous about being a leader? a speaker, etc? can’t wait to hear all about that.. yay!! I am a little nervous but I know what Weight Watchers is AWESOME and that they will train me well. You can do it. Just remember it’s one meal at a time. Don’t beat yourself up. Walk just a little bit further than the day before. If I can do it ANYONE can.